Winter is coming! One of the problems often associated with winter is dryness. Due to the low temperature, air loses its ability to hold moisture. Hence, in winter, the air feels drier. Such dryness may cause irritation on many parts of the body, such as the skin, lips, nose, and throat. Dry air feels very uncomfortable and perhaps really painful for some people. If you often find yourself tortured by dry air, you may need to install a humidifier in your home. A humidifier is a device designed to release water vapor into a space in order to increase the humidity level. When used correctly, a humidifier can alleviate or at least reduce your dry skin, chapped lips, and sore throat problems. It is a must-have for winter. 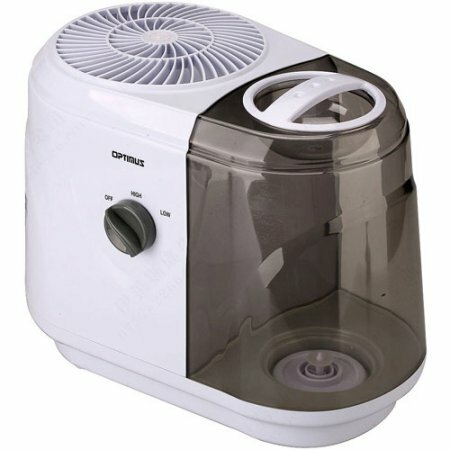 However, there are various types of humidifiers available in the market. The two main types of portable humidifiers are ultrasonic humidifiers and evaporative humidifiers. Although they both are indeed able to humidify your room, they have significant differences in the ways they produce moisture. See the differences between ultrasonic and evaporative models below. 1 What is an Ultrasonic Humidifier? 2 What is an Evaporative Humidifier? An ultrasonic humidifier is a humidifier that utilizes a ceramic diaphragm that is vibrating at an ultrasonic frequency in order to produce water droplets which are silently released by the humidifier in the form of cool fog. There is usually a tiny fan that is responsible for pushing out the cool fog into the room. But there are some models that don’t have any fan, meant for personal use. Ultrasonic humidifiers are known to be quiet and energy efficient. However, some models don’t have any filter to absorb the mineral scale deposits and thus produce grayish dust along with the cool fog. You can use demineralized water to prevent the grayish dust, but it is quite pricey. Some models do come with ceramic cartridges that need to be replaced every once in a while to do the job, and they are quite efficient. Also, if you use an ultrasonic humidifier, make sure that you disinfect the water and the humidifier because bacteria may be present and get discharged into the air along with the cool fog. What is an Evaporative Humidifier? Evaporative humidifiers are often considered as the most basic and also the most common type of humidifiers. An evaporative humidifier usually consists of three basic parts, which are the reservoir, the wick, and the fan. The wick is made of a porous material, and is designed to absorb water from the reservoir and provide a large surface area for evaporation. The evaporated water is then drawn into the fan, which then releases it as a water mist or spray. Most models are equipped with filters designed to trap mineral scale deposits. So, they won’t produce grayish dust. Some more advanced models even add aroma therapy. However, if the humidifier has a filter, you will have to clean it or replace it regularly. In general, evaporative humidifiers are more affordable and budget friendly. This is because the design of an evaporative humidifier is simpler, without the need of very advanced parts. Those models with aroma therapy are pricier, though. Well, even though the upfront cost is lower, an evaporative humidifier will require constant maintenance costs later. You will have to replace the filter regularly. On the good side, such filters are usually cheap. On the other hand, ultrasonic humidifiers are generally more expensive than evaporative humidifiers. This is because the diaphragm that vibrates the water at an ultrasonic frequency is quite a complex and advanced part. Depending on the model you choose, an ultrasonic humidifier may require more or fewer maintenance costs. If it has a ceramic cartridge for collecting mineral scale deposits, you will have to replace regularly too. Don’t forget to disinfect the water and the humidifier regularly to prevent the spreading of mold and bacteria. As mentioned above, ultrasonic humidifiers generally produce more whitish / grayish dust particles than evaporative humidifiers, especially if they are not equipped with onboard filtration packs. Those dust particles are actually mineral deposits from the water. The harder your water is, the more extreme the presence of these dust particles will be. The dust is generally not harmful, but you may find it annoying and want to clean it off from your household furniture. Also, the dust can be dangerous if inhaled by kids and asthma sufferers. Ultrasonic humidifiers produce such dust particles because they don’t have any filter to trap or contain those mineral deposits. 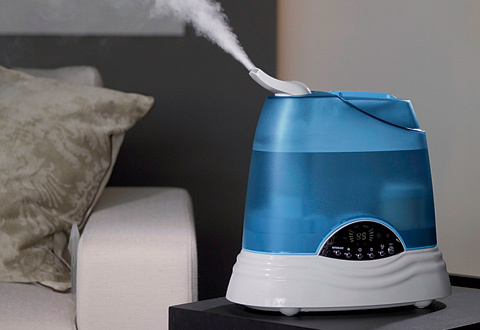 Usually, an ultrasonic humidifier with a larger moisture output will produce more dust. However, a small-size personal ultrasonic humidifier may produce very tiny dust particles that aren’t noticeable. On the other hand, evaporative humidifiers generally don’t produce much dust particles, thanks to their filters. But you will have to replace the filter in an evaporative humidifier regularly as it collects dust. If you are going to place the humidifier in your bedroom, you may want to get a model that is quiet when working. Well, if you think that ultrasonic humidifiers are noisy because they are ‘vibrating’, you are wrong. Ultrasonic humidifiers are actually very quiet, especially those models that don’t have any fan. The ultrasonic vibration is hardly audible to human ears. On the other hand, evaporative humidifiers work with fans, and thus may be somewhat noisy. Ultrasonic humidifiers and evaporative humidifiers offer different advantages. In general, evaporative humidifiers seem to be more convenient. They are cheaper, and they have filters to capture those dust particles. Of course, you will have to change the filter and clean the humidifier regularly to keep a healthy living space. 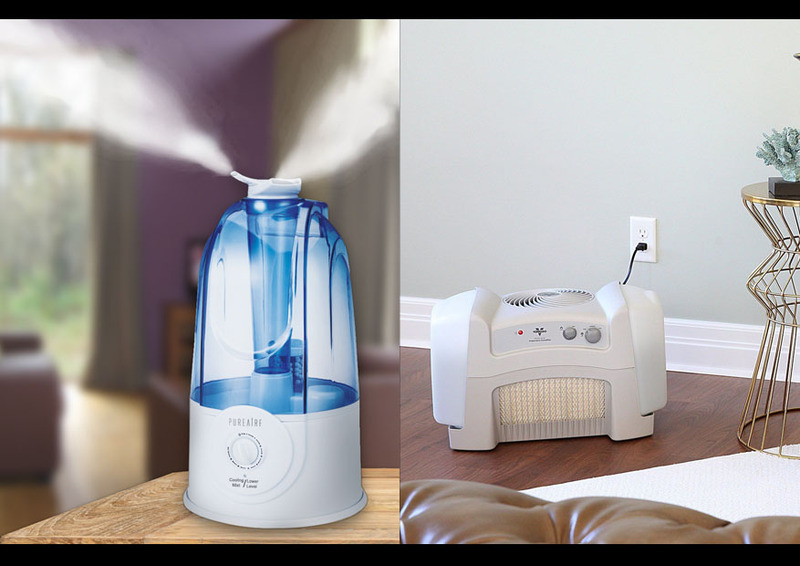 Nevertheless, if you want a quiet device and you don’t mind spending some extra bucks, you can choose an ultrasonic humidifier instead – but make sure that you choose a model that has a demineralization cartridge (or use distilled/demineralized water) to prevent the forming of the dust particles.